Shi mon Gibson is currently a Senior Associate Fellow at the W.F. Albright Institute of Archaeological Research and a Visiting Professor of Archaeology at UNC Charlotte. 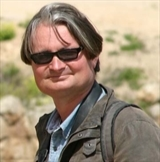 Gibson undertook his academic studies at the Institute of Archaeology, University College London, where he also completed his Ph.D. on Landscape Archaeology in the southern Levant. During the past 20 years, Gibson has conducted numerous excavations and field surveys in different parts of Israel. Between 1989 and 1995 he undertook research and cataloging in the archives of the Palestine Exploration Fund in London. He was the head of the Research and Scientific Reports Department of the Israel Antiquities Authority from 1995 to 1999. Since then, he has dedicated himself to a number of major excavation projects, notably at Suba and Mount Zion, where he co-directs the dig with James Tabor. Gibson is the author of more than 100 research articles on a variety of subjects, and for more than two decades served as the chief editor of the archaeological journal Bulletin of the Anglo-Israel Archaeological Society, published in London. He was also one of the divisional editors of the new edition of the Encyclopedia Judaica published in 2007. He is the coauthor of two scientific monographs on the antiquities of Jerusalem (on the Church of the Holy Sepulchre and on the Temple Mount), and has edited the Archaeological Encyclopedia of the Holy Land (2000) and The Illustrated Dictionary and Concordance of the Bible (2005). His book of 19th-century photographs of Jerusalem (Jerusalem in Original Photographs) was published in 2003. A book on his archaeological work at Suba, entitled The Cave of John the Baptist, was published in 2004. Recent publications include Flights into Biblical Archaeology (2007) and The Final Days of Jesus (2009). Contact Dr. Gibson at sgibso34@uncc.edu.